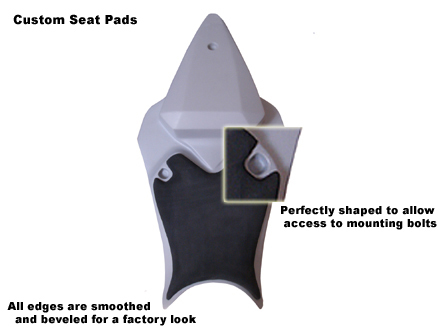 Each Armour Bodies seat pad is custom shaped matching the tail like a factory seat. All the edges have been beveled, smoothed and shaped around the mounting points giving your tail the finished look of a factory superbike.Each pad is made from a high-density 15mm foam with a strong 3M adhesive backing keeping it securely in place. The high-density foam will survive multiple seasons of use and will not ball up or tear like other pads.